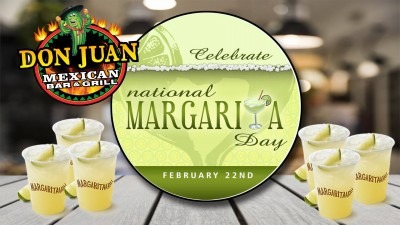 Celebrate National Margarita day at Don Juan's. With the fire we plan on having at this fiesta it’s great that we are next to Winchester fire hall! This national holiday is always a great time at Don Juan’s! We will have food and drink specials all day and we will have a DJ on the back patio for your dancing pleasure (after 9pm). There is a reason why so many say that Don Juan’s is the best Mexican Food restaurant in all of WNY. Stop out and see the Don Juan difference (no cover charge).